Last month, M.A.M. student Veronica Inberg helped organize a mixer for all graduate students at Columbia. The mixer–the first of its kind–was held at a nearby tavern and saw quite a bit of success. We sat down with Veronica and caught up with her about the event! Can you tell us a little bit about the graduate student mixer? The graduate student mixer was planned by myself, Kelly Schmader, and Colleen McCulla. We worked with Kasey’s Tavern and the Graduate Admissions team in order to get all of the grad students at Columbia together. Our idea was to get students across all disciplines in one place (preferably a place with beer) to talk about our experiences at Columbia and see if there were any opportunities for collaboration. To our surprise, Grad Admissions provided pizza and salad, which was great and probably a big reason why some people came (can’t beat free dinner). The idea for this event came from a need to meet students in other departments and find ways to collaborate. We all felt like we didn’t know what was going on at Columbia, especially on a graduate level, and were mildly disappointed that the school wasn’t doing more to bring us all together. As Art and Art Management students, we knew that we would only be successful (both personally and professionally) if we started to network with other Columbia students and to get clued in to what they were working on and how we might be a part of it or promote it. The event was quite a success! More than 40 students showed up. Did you expect that sort of attendance? 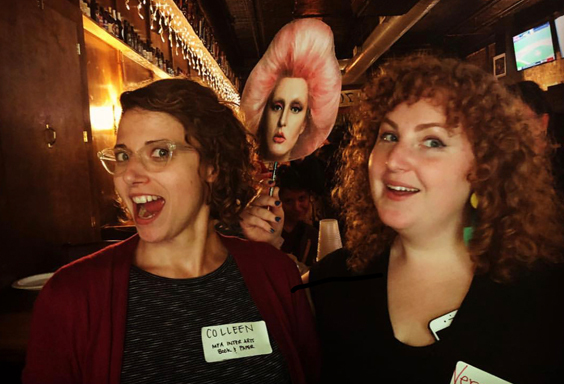 I think Kelly, Colleen, and I are pragmatic realists – we were hopeful for a positive turnout but also know that Facebook RSVPs don’t really tell you anything. We spent a lot of time thinking about a way to get everyone under one roof, and we had to go through some hoops to make that happen. The fact that more than a handful of people showed up was both surprising and extremely validating, considering how hard we worked and how much time we spent making this happen. All of that is to say, no, I don’t think we expected it. What value do you see in collaboration between grad students from different departments? First, it is exciting to see Columbia jumping on board in regards to collaboration between different departments. Having the European Devised Performance Practice (MFA) partake in BUSE classes is a great initiative. In the future, I hope more classes focus on collaboration between departments, as well as groups outside the school. However, I think a lot of collaborations would happen organically if there was more emphasis and importance placed on it. Just getting people together to talk about what they are interested in and what resources they need to make it happen could help turn abstract ideas into actual plans, businesses, etc. When is your next event? How often do you plan to organize these mixers? That’s a good question. We are hoping to have another event soon; however, we are all pretty busy this semester. A mixer every two months or so would be a great goal to strive for, but finding a time that works for everyone can be difficult. Also, there are a few events coming up that are graduate-focused but not necessarily a “mixer.” They are in collaboration with the Gallery Management class and the exhibit that will be opening in The Hokin Gallery and should be really fun. (Be on the lookout for that email.) I would encourage everyone in their respective graduate programs to initiate events that they think are needed at Columbia or relevant to what they are passionate about. Chances are, someone else will be too.